I often get asked what I have for snacks and these granola bars are one of my favourites. If you watched my food preparation video, you would have seen me speak about these. They are quite high in calories because of the nuts and seeds, but they are not “bad” calories. Because I eat a lot of fresh produce, it can sometimes be hard for me to reach my calorie limit for the day, so eating one of these ensures that I am eating enough. 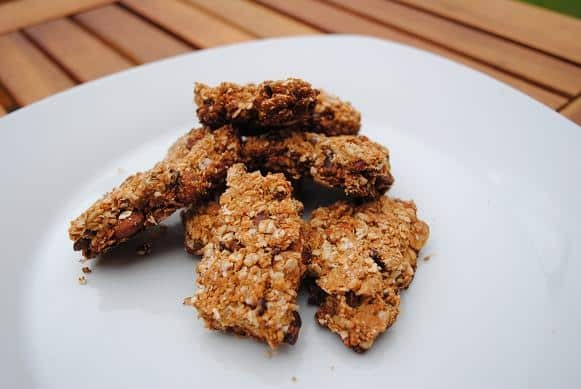 I love granola bars, they are great for an on the go snack too, but if you look at the ingredients of the store bought ones, they have way too many things added to them and you can make them yourself with much less ingredients and they taste so much better. These don’t make the perfect bar shapes, so when you take it out of the oven, leave it to cool for a little while and then break into the size you want. This recipe made about 12 pieces for me. I also like to take one of the “bars” and crumble it up and put on top of yoghurt and fruit for breakfast. 1) Heat the oven to 175C/350F. 2) Add all of the dried ingredients to a large bowl and then mix in the nut butter and honey and stir. You may need to add a little more nut butter or honey if it is too dry, depending on what nut butter you are using. 3) Add the mixture into a greased dish. The size dish you use depends on the thickness of the bar you want. 4) Bake for 30-35 minutes. 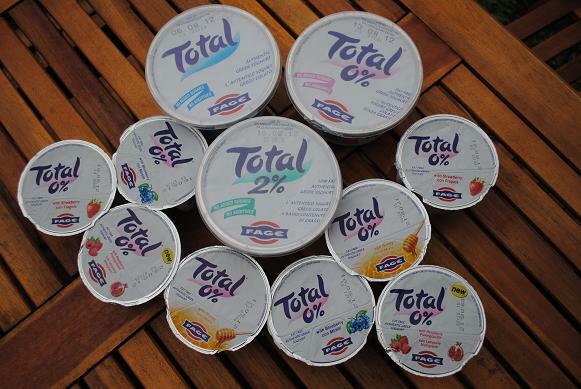 In other exciting news, the lovely people at Total Greek Yoghurt sent me lots of lovely yoghurt this morning to review some of their new flavours. I would just like the state that in regards to reviews of products that I do, whether I get sent the product to test out or not, I will never review a product that I don’t believe in, or that I wouldn’t use/eat myself. I have been eating Total Greek Yoghurt for years and it helped me so much whilst I was losing weight, so I am happy to share my opinions on this with you in the review. I also can’t wait to try the split pots – the pomegranate raspberry looks delicious. Today has been my rest day from the gym and it is nice to get lots of other things done. As well as eating a lot of yoghurt (look at how it is staring at me), I have been writing lots and getting organised – it makes a change. What is your favourite thing to snack on? 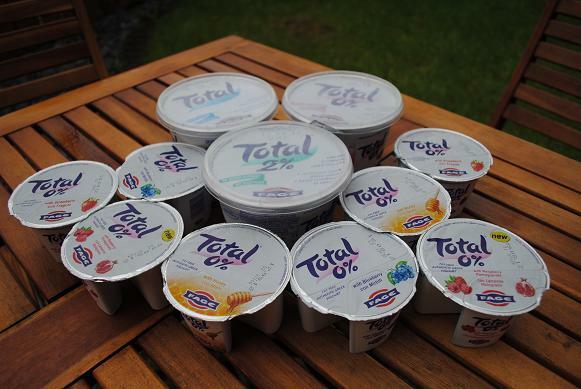 What is your favourite yoghurt topping? I want to dat thank you to who posted this recipe! I am a persoon who eats very much so I often get hungry in the evening or in the afternoon. When I get hungry, I always go searching for some snacks. The problem is when I search for a snack, I always pick the unhealthy snack. So I started looking at this recipe and try to make it. I have to tell you I’m not The best cook, but it still was very easy to make. It also tasted very good and is also super healthy. These will be great to pack for a mid-morning snack at work! Well done on losing 50lbs. And 37 mins for a 5K is not slow at all – I would say that is pretty quick. Hi. I just made these bars, they’re really delicious, only problem is they were too dry and fell apart as soon as I tried to cut them, even though I added extra honey and some water. Any suggestions? I think there are too many oats. 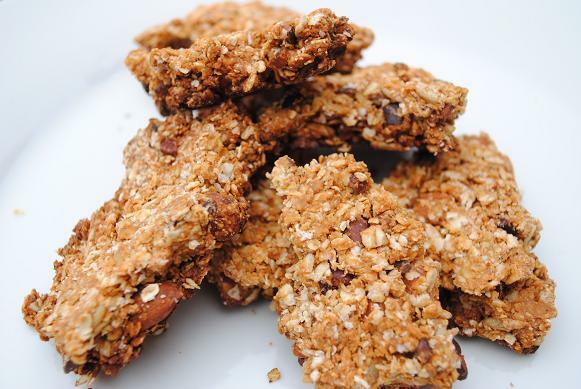 I love homemade granola bars and just tried this one out. Are you sure about the quantities? 350 g is a lot of oats; I just could not make the ingredients make stick together, although I added more butter and some liquid. Still – the result was somehow dry. Hi, this looks like a great recipe! Do you have a calorie count per serving? And serving size? I LOVE homemade granola bars. This recipe looks great! They may be *too* great. I can’t stop eating them! Could you let me know what else besides nut butter you could use in this? My daughter is allergic to all nuts. I assume the creaminess of the nut butter adds to it. You can buy or make sunflower seed butter than could be used instead. Is she allergic to almonds too? As they are not technically a nut. My husband is allergic to all nuts, but can have almonds – so I use almond butter.